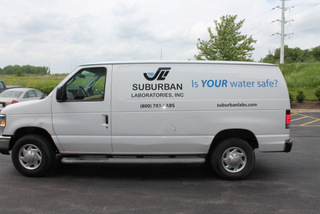 Suburban Labs Shines with New Van Graphics in Geneva IL! 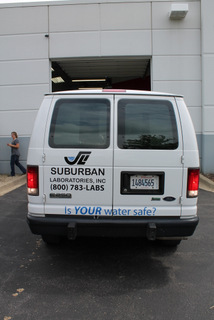 Suburban Laboratories provides analytical testing in an environmental lab facility. Accredited for the testing of Illinois EPA drinking water standards, waste water and also solid waste, the facility is located at 1950 South Batavia Avenue in Geneva. Site evaluations and monitoring are frequently done by sending collection representations to the sites. How does this business succeed at getting the work out about its services while going on calls at client sites? With van graphics for Geneva, IL, locations! When the business enlisted the help of Mark Your Space to add some informational graphics that would help consumers to connect the company’s name to its niche service, we gladly complied. The van is white. Against this backdrop, be placed the company’s name, logo, phone number and website address in black. In blue colors, we posted the thought-provoking questions, “Is your water safe?” The back of the van features almost all of the same information except for the website address. Water company van graphics in Geneva, IL, are not very often seen. This underscores the importance of turning a niche company’s automobile into a moving billboard. There are probably plenty of consumers who do not even know that there is a company out there that provides this type of service. When Suburban Labs sends its van into the area, this information spreads quickly and is sure to generate more interest in this particular service. Imagine your niche company being advertised on this large scale! Generate interest in your niche. If folks do not know that you offer mobile widget repair services, how can they think of calling you for assistance? By introducing consumers to your niche and your company simultaneously, you have the advantage of creating a need and then offering a means for filling it. This puts you into a very profitable position. Increase the visibility of your business. Once the consumer is aware your niche, it is important that this buyer also knows about your company and its products or services. Highlight the different services you offer – particularly if they set you apart from the competition. Offer easy contact options. Even if consumers are not currently in the market to make a buying decision that involves your particular product or service, they might still want to have your contact information for future use. The display of a phone number and a website address are great ways of offering means of connecting at the consumer’s leisure. For business owners who are very active on social media, the addition of social media icons is also a good way of getting – and staying – in touch. If all of these options are confusing, talk to our knowledgeable van graphics experts. We welcome the opportunity of talking through your marketing needs and getting to know your company and its niche. We can offer you plenty of suggestions with respect to the best placement of graphics and text. Do not forget to also discuss the use of a QR (quick response) code for your next marketing campaign. We can add on this code with your regular graphics or put it on later. 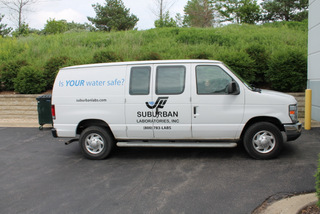 Title: Suburban Labs Shines with New Van Graphics!